How China Sees the World explores the roots of the growing Han nationalist group and the implications of Chinese hypernationalism for international relations. Han-centrism, a virulent form of Chinese nationalism, asserts that the Han Chinese are superior to other peoples and have a legitimate right to advance Chinese interests at the expense of other countries. Han nationalists have called for policies that will allow China to reclaim the prosperity stolen by foreign powers during the "Century of Humiliation.” The growth of Chinese capabilities and Han-centrism suggests that the United States, its allies, and other countries in Asia will face an increasingly assertive China - and also one that thinks it possesses a right to dominate international politics. John M. Friend and Bradley A. Thayer explore the roots of the growing Han nationalist group and the implications of Chinese hypernationalism for minorities within China and for international relations. 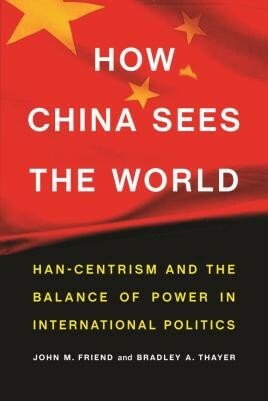 The deeply rooted chauvinism and social Darwinism underlying Han-centrism, along with China's rapid growth, threaten the current stability of international politics, making national and international competition and conflict over security more likely. Western thinkers have yet to consider the adverse implications of a hypernationalistic China, as opposed to the policies of a pragmatic China, were it to become the world's dominant state.